It shall be the son, the firstborn in the new monarchy, who shall quiet the fears and unite the nation again. Due to my crazy summer schedule, I haven’t had a chance to finish this book, so this will not include a review. However, I’ve started reading it and so far, I like it. 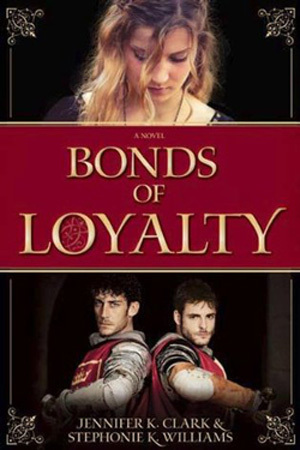 Be sure to scroll down to enter to win a copy of Bonds of Loyalty, plus a $25 Amazon Gift Card! Jennifer K. Clark and Stephonie K. Williams are sisters by chance but became friends by choice when a year of rooming together at college taught them how to get along. Now “play”-at-home moms, separated and living in different parts of the country, they stay in touch and support each other in their individual projects. Jennifer K. Clark lives in the small rural town of Wellington Utah, as much as her husband wishes it was Wellington New Zealand. After years of entertaining her three children with infamous made-up stories, she decided to put her imagination to good use and became an author. She likes to add a touch of romance to her novels along with a healthy dose of adventure. Fueled by Lindt Chocolate Truffles and Sour Patch Kids, she now spends a copious amount of time with the characters in her head. In her spare time she likes to create science experiments with the ingredients in her potions cupboard, debate which Doctor is her favorite (currently the 10th…or maybe the 11th), and—when she has time—watches the A&E version of Pride and Prejudice. Stephonie K. Williams makes her home in a quaint farming town in eastern Iowa with her husband, three cats, and a budding ninja. Two of her favorite things in Iowa are the fireflies (aka lightning bugs) and cows, especially the calves. Despite having lived there for 15 years she still misses the majesty and tranquility of the mountains of Utah where she grew up. She has a vast collection of fortune cookie fortunes because she has yet to determine if it is unlucky to throw them away. She also loves to quill, the art of rolled paper, not to be confused with quilting. Stephonie is passionate about education and enjoys visiting schools to teach classes on creative writing. She has written poetry, short stories, and dissertations, although Mark of Royalty was the first of her work that she was brave enough to submit for publication. Click to read Book Geek Reviews Giveaway Policies.